In the late 1800s, Thomas Edison got into the doll business. Not long after inventing the phonograph, the prolific entrepreneur imagined a line of toys that would make various sounds, like a train that would imitate the puff of steam exhaust, dogs that could bark, and dolls that could speak. Talking dolls were already a popular toy among children of the time, but they relied upon primitive technology to imitate simple words like “mama” and “papa.” Edison’s dolls would feature actual recordings of human speech, turned on by cranking a shaft in the doll's back. Recently, the fragile dolls began to speak again, thanks to a new technology that can reconstruct audio from previously unplayable recordings, developed by Lawrence Berkeley National Laboratory and the Library of Congress. In April, the National Park Service posted eight Edison Talking Dolls recordings created in the late 1880s on its website. 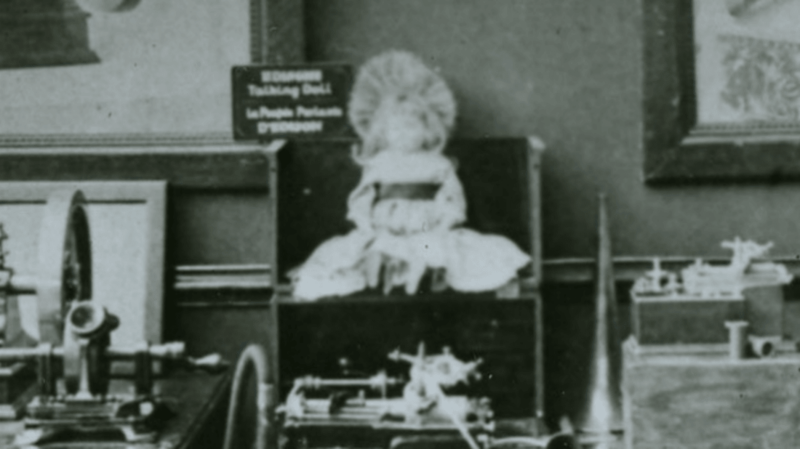 Edison’s talking dolls recited nursery rhymes like “Jack and Jill,” “Little Jack Horner,” and “Twinkle Twinkle Little Star,” by means of a tiny cylindrical phonograph inserted into the doll’s body. At first, Edison tried making the recordings himself. As it happened, people thought a delicate doll of a young girl, rosy-cheeked and waxen-faced, sounded weird emitting the voice of a gruff adult man, so he eventually hired a team of young women, who were paid a few cents per record they made. (Arguably, these ladies were the world’s first recording artists.) The audio in the prototypes wasn’t entirely clear, so Edison and his team wanted the dolls to recite snippets of poems and rhymes people already knew. Though he had worked on the doll concept for more than a decade, the experimental toys proved to be unpopular playthings. One Washington Post headline when the dolls debuted read “DOLLS THAT TALK. They Would Be More Entertaining if You Could Understand What They Say,” as historian Patrick Feaster writes in his excellent cultural history of the toys. And they were relatively expensive: An undressed doll cost $10 in 1890, around $267 today. Only a month after the debut launch in April 1890, Edison ceased production, having sold only 500 dolls. Many of the remaining dolls were sold sans-phonograph. Dolls are already the world’s creepiest playthings, lodged deeply in the uncanny valley, that weird purgatory where things look almost human, but just off enough to unsettle. Imagine a glass-eyed baby doll that emits an unintelligible, high-pitched crackling voice from a mouth that doesn’t move, and you’ve got an Edison Talking Doll. (The New York Times has some great photos of them.) Thanks, modern technology, for allowing these eerie, century-old doll voices to haunt our dreams yet again. Listen to "Twinkle Twinkle Little Star" below, and check out all the tracks from the National Park Service.